I read this Stock Market Philippines related report from GMA Business News. What will happen in the Philippines stock market three years from now? According to some stocks analyst, it's possible that we will hit the 10,000 mark within three years. That's a promising statement but if that will happen in three years time, that will be the time where we can separate the boys from the men, the-truly-rich and learned-investors vs purely expectators. 10,000 is not too far from 7000. 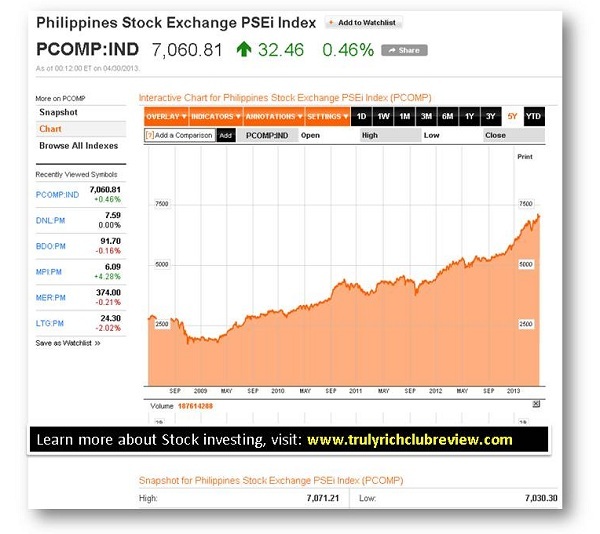 Below is the Philippines Stock Exchange PSEi Index as of April 30, 2013. Let's see that will happen in three years time. COL Financial expects the bellwether PSE index to hit 7,400 this year, up from last year's 5,812.73 finish. 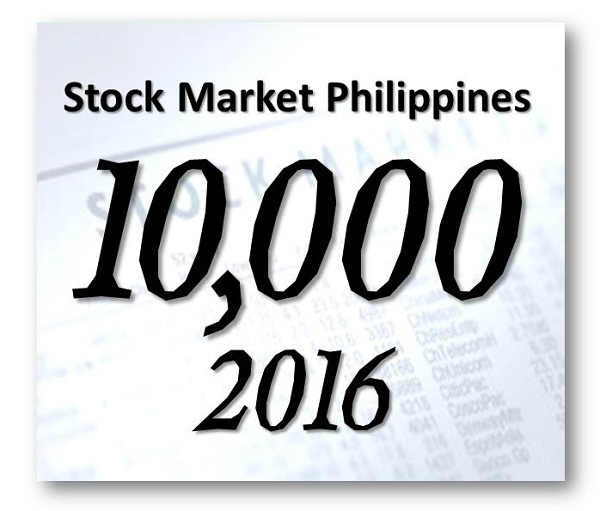 The PSEi could reach the 10,000 mark within three years, it said. “I'm not saying that you should put all your money into the stock market. But make sure you allocate a portion of it to maximize returns,” he added. In putting money into the stock exchange, Bate said "… look at sound companies like blue chip ones that can withstand an economic slowdown given their strong financials, noting this approach reflects “the right discipline” in investing. “There's no point trying to get... or hitting the jackpot in a hurry,” he said. 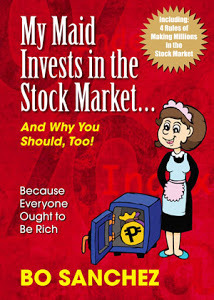 Are you interested in Stock Market investing in the Philippines?